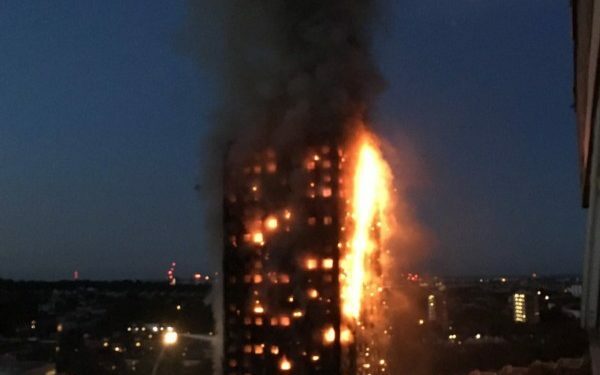 Firefighters have been working through the night to put out a huge blaze that engulfed a residential apartment block in the Grenfell Tower on Wednesday. According to London Ambulance service, 30 patients have been taken to five hospitals in the wake of the accident. 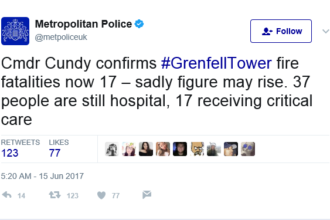 London Mayor Sadiq Khan said on Twitter that a major incident had been declared. London fire commissioner Dany Cotton in an early morning statement, confirmed that there have been a number of fatalities. She could not confirm numbers because of the complexity of the building. “This is an unprecedented incident. In my 29 years of being a firefighter I have never ever seen anything of this scale. Firefighters are working very hard at the moment. This is a major fire that affected all floors of this 24-storey building from the second floor upwards. 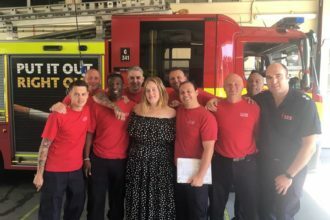 I have over 200 of my firefighters and officers attending this incident, with 40 fire engines and a range of specialist vehicles, including 14 fire rescue units,” Colton said. Friends and family have said they have not been able to reach people inside. Police has set up an emergency number for people concerned for friends and families on 0800 0961 233.